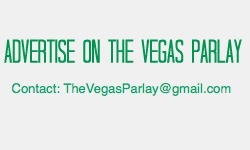 Seats: Approximately 100 with additional VIP areas for horse and sports wagering. Screens: Over 30 screens which can be configured to show various events simultaneously within a 100-foot wide high definition panoramic screen. The Venetian sports book is a large and open space, which opened in late 2011 after Cantor Gaming took over sports book operations at the Venetian and Palazzo. 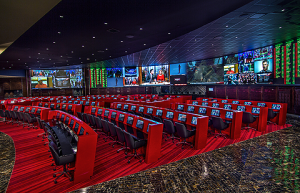 The size and open feel is impressive, however the highlight of this sports book is the 1,000 square foot panoramic screen that is noteworthy for not only its size but also the ultra high-definition clarity – one of the best visuals in all of Las Vegas. The seating area is large and there is a separate VIP section for heavy hitters. It has been reported that horse racing and sports players loading up on bets of $10,000 or more can enjoy the VIP areas, so if you are that type of sports bettor, the sports book manager can arrange lifting the velvet rope to accommodate you. As with all Cantor Race and Sports books, drinks are not comped. For your viewing and drinking pleasure however, there is a very well laid out bar to the rear of the sports book, with great line of sight views to the high-def screens. 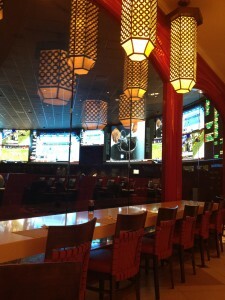 This sports book is also a non-smoking facility, which is another plus for those preferring a smoke-free environment. There are several food options within The Venetian with Noodle Asia located right next to the sports book. This 24-hour Asian restaurant is generally always busy and is known for its fried rice and noodle soups that assist in “hangover recovery.” If you ask, you can be seated in the side area of the dining room, which is open towards the sports book and provides views of the screens showing the sports action. Odds and Ends: The Venetian sports book (as well as other Cantor establishments) offers a fantasy sports related wager for NFL, MLB, and the NBA. The concept entails selecting your fantasy team to square off vs. a Cantor generated fantasy team with varying odds. 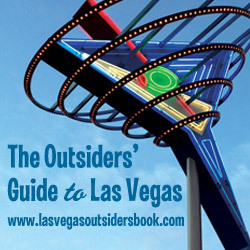 If you are looking for comped drinks and prefer an old school Vegas sports book that has a snack bar serving club sandwiches and Coors Light there are other options for you. The Venetian sports book is a good spot if you are into a smoke free environment with sleek and modern amenities that include premium quality high-def screens for viewing the sports action. But, get here early on big sports days – on a recent visit during NFL Sunday, it was standing room early and packed to the gills.